For most of us, these last couple of days felt like a blanket of woes pressing down mercilessly. Every new update on the recent unbelievable news of persecution coming out of The States and beyond was a disheartening blow. It’s important that we realise the weight of our current situation in order to organise and stand up for our beliefs. To be able do that however, I believe you need a bit of leeway within your soul to get up again. So here's a little line-up of reactions and emotional contributions from your faves to lift your spirits a little. No matter what kind of foolishness prevails, you know you can count on Ms Fenty to always keep it Rihl. Kindly reminding y’all what an immigrant looks like, while simultaneously clapping back to a certain chicken fiend, it's just the Rihanna way. The SAG Awards on Sunday gave Hollywood the perfect opportunity to speak out in a powerful way, and the masterful Mahershala Ali certainly got the cue. He gave a stirring, emotional speech and touched on what he learned about persecution while filming Moonlight and how we should never get hung up on each other’s differences. As if I wasn’t already in enough of an emotional shambles ahead of the Moonlight screening I’m about to attend. 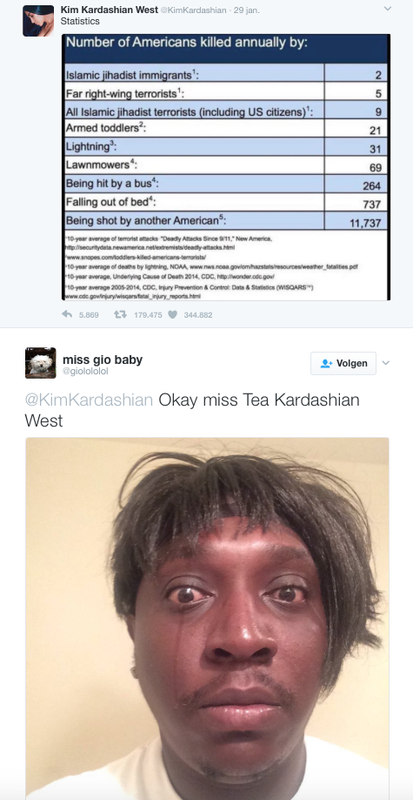 Kim came with the figures and Kardashian stans live for a political Kim moment. Many more outpourings of support came and will come. All I hope is that focusing on a few positive messages here and there will embolden you to get out there, be it with a sass-filled sign, quiet donation or well-informed status update and show ‘em WHAT'S GOOD.